To perform a within-subject comparison of the cortical bone micro-architecture of the maxillary sinus floor (MSF) to that of the buccal aspect of the anterior and posterior maxilla. Micro-CT scans of the buccal aspect of the anterior and posterior maxilla and of the MSF in 14 human anatomical specimens were recorded. Within-subject comparisons were performed for cortical thickness (Ct.Th) and porosity (Ct.Po), average pore volume (AvgPo.V), and pore density (Po.Dn). The MSF presented the lowest and the anterior maxilla the highest Ct.Th, while Ct.Po was significantly higher at the MSF compared to the posterior maxilla (p = 0.021). No relevant differences were recorded for AvgPo.V and Po.Dn among regions (p > 0.067). Further, an increased Ct.Th at the MSF was significantly associated with a lower Po.Dn, while a higher Ct.Th and an increased AvgPo.V in the anterior maxilla were associated with a higher Ct.Th and an increased AvgPo.V, respectively, in the posterior maxilla and MSF. Finally, within each region, the AvgPo.V was associated positively with Ct.Po and negatively with Po.Dn. The cortical bone of the MSF is slightly less thick and slightly more porous compared to the cortical bone at the buccal aspect of the anterior and posterior maxilla. During lateral and vertical bone augmentation procedures, the cortical recipient bone is perforated several times to open the bone marrow compartment to facilitate provision of osteoinductive cells and molecules in the augmented space. Whether it is meaningful to approach the MSF in a similar way during MSF augmentation procedures or whether the slightly more porous structure of the MSF observed herein reduces the cortical barrier function already sufficiently has to be assessed in future clinical trials. The online version of this article ( https://doi.org/10.1007/s00784-018-2573-0) contains supplementary material, which is available to authorized users. Alveolar ridge resorption after tooth loss follows a specific pattern; i.e., initially loss in width occurs and then loss in height follows [1, 2]. Thus, bone augmentation procedures are frequently required to provide sufficient bone volume for implant installation. In the mandible and in the anterior maxilla, use of autogenous blocks and/or particulated bone grafts and substitutes, and guided bone regeneration procedures are often indicated , while in the posterior maxilla, maxillary sinus floor augmentation procedures (MSFA) are mostly performed . Independent of the procedure and region, the success of bone augmentation procedures is dependent on a stable wound healing environment, including provision of angiogenic/osteogenic factors and cells populating the augmentation space, supporting sufficient capillary ingrowth and new bone formation, and successful incorporation of the grafting material . A standard approach during block augmentation or guided bone regeneration (GBR) procedures is to perforate the cortical bone of the recipient site (i.e., the buccal and/or crestal aspect of the alveolar ridge) thereby opening the bone marrow space [6, 7, 8, 9], in order to facilitate provision of angiogenic/osteogenic factors and cells in the augmentation space. Several preclinical in vivo trials have demonstrated histologically the efficacy of such perforations, in terms of increased new bone formation and/or bone graft volume maintenance [10, 11, 12, 13]; this was recently confirmed also in a RCT . Nevertheless, intra-antral perforation of the bone of the maxillary sinus floor (MSF), after elevation of the Schneiderian membrane, is not a standard approach and it has only recently been suggested in a case report . This appears somehow strange, considering the fact that the MSF also consists of a cortical bone layer, similarly to the lateral aspect of the alveolar process. In fact, a recent study of computed tomography images of 100 patients  revealed that in 30% of the cases, the cortical layer of the MSF appeared denser or equally dense when compared with the surrounding cortical areas. In this context, it appears relevant from a clinical perspective to compare in more detail the cortical bone micro-architecture of the MSF with the cortical layer of the alveolar ridge. The aim of the present study was thus to perform a within-subject comparison of the cortical bone micro-architecture of the MSF to that of the buccal aspect of the anterior and posterior maxilla. The study protocol was approved by the ethics committee of the Medical University of Vienna (EK-Nr. 1557/2016). Twenty maxillae of human phenol-formaldehyde-anatomical specimens were collected, from corpses bequeathed to the Anatomical Institute of the Medical University of Vienna for medical–scientific research and training purposes. Fixation of the whole human corpses was performed by perfusion of the vascular system with a phenol-formaldehyde solution (i.e., 4% phenol and 1% formalin in water) for at least 24 h in addition to the whole-body immersion in the same solution for at least 6 months. The following selection criteria were defined for the present study: (1) edentulous maxilla; (2) no apparent recent tooth extraction; (3) preserved naso-palatine canal, for midpoint determination; (4) no apparent signs of previous MSFA or any other bone augmentation procedure; (5) no dental implants; (6) no apparent oroantral communication and no cystic lesion in connection to the edentulous sites and/or the maxillary sinus; and (7) > 2 mm residual alveolar bone height below the sinus. Details regarding age, time elapsed since tooth loss, possible regular wear of mandibular dentures, or intake of any medication affecting bone metabolism were not available. All samples were cut/trimmed to a similar size, fitting relatively tightly in standardized containers and scanned for structural analysis by micro-CT (Viscom XT9190-THP) (transmission tube, digital detector, voxel size 35 μm3, 120 kV, 400 μA; filter, 0.75 mm copper; exposure time: 1.400 ms; zoom factor: 3.300; 1440 projections; scanning time ca. 130 min). During scanning, the samples were wrapped in formalin-soaked tissue and kept in air-tight containers, to avoid evaporation that might influence the scanning quality. Further, no calibration of the intensity values of the scans was used; instead, an automatic threshold selection, based on a manually selected region in the anterior maxilla containing both cortical and trabecular bone, as described by Otsu et al. , was used. After upright orientation of the scans with the hard palate horizontally positioned, the following three volumes of interest (VOI) were defined with a “region growing” algorithm in Definiens Developer XD 2.1.1 (Definiens AG, Munich, Germany): the buccal aspect (1) of the anterior and (2) of the posterior maxilla, and (3) the MSF (Fig. 1, Appendices 1 and 2). Specifically, the anterior maxilla was limited mesially by the canalis incisivus and distally by the beginning of the maxillary sinus; the posterior maxilla started at the distal end of the anterior maxilla and extended 30 mm distally or until the end of the sinus (Fig. 1a). 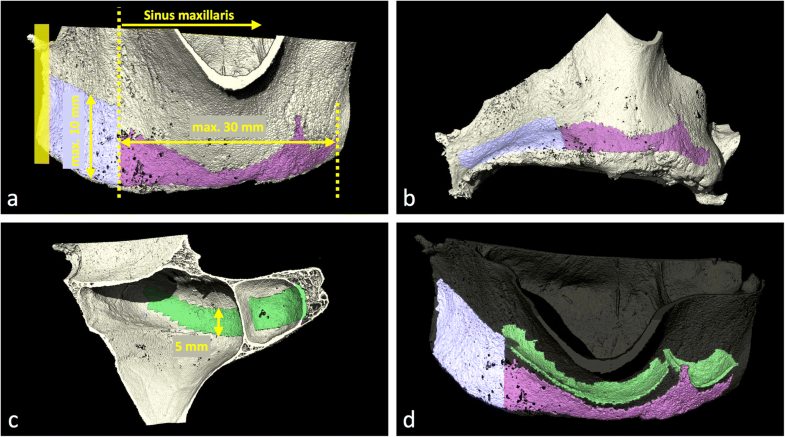 Further, the VOI of the anterior and posterior maxilla extended apically from the alveolar crest 10 mm towards the direction of the maxillary sinus or until the level of the MSF (i.e., the buccal wall of the maxillary sinus was excluded) (Fig. 1a–d); sites with < 2 mm residual alveolar bone height have been excluded to avoid including specimens with the cortical layer of the MSF fused with that of the alveolar ridge. The VOI of the MSF included the most apical aspect of the maxillary sinus, had a standardized bucco-palatal width of 5 mm, and followed the extent of the posterior maxilla (Fig. 1c). Normal distribution of all data was confirmed graphically by Q-Q-plots of the residuals and homogeneity of the variance of the four tested parameters was confirmed by the by Mauchly’s test of sphericity (Ct.Th: χ2(2) = 30.058, p = 0.971; Ct.Po: χ2(2) = 4.706, p = 0.095; avgPo.V: χ2(2) = 0.700, p = 0.705; Po.Dn: χ2(2) = 1.721, p = 0.423). 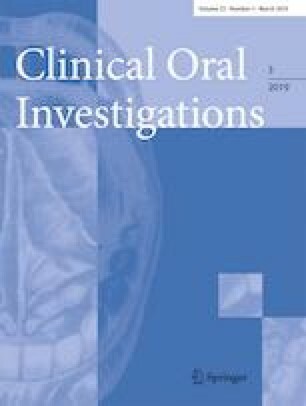 Thereafter, differences between males and females were assessed by independent t tests and differences among the 3 VOIs (i.e., anterior and posterior maxilla and MSF) by one-way repeated measures analysis of variance; in case of significance, a post hoc analysis with a Bonferroni adjustment was conducted. Correlations among the cortical bone parameters (i.e., Ct.Th, Ct.Po, AvgPo.V, Po.Dn) were analyzed with the Pearson’s correlation coefficient. Statistical analysis was performed using SPSS Version 23.0 (SPSS Inc., Chicago, IL, USA) and p values < 0.05 were considered as statistically significant. Fourteen (4 male and 10 female donors) out of the 20 collected specimens were included in the final analysis; six specimens were excluded either due to the presence of a cyst in the sinus or an oroantral communication. The cortical bone micro-architecture has been described by the following four parameters: (1) Ct.Th, (2) Ct.Po, (3) AvgPo.V, and (4) Po.Dn (Table 1, Fig. 2). 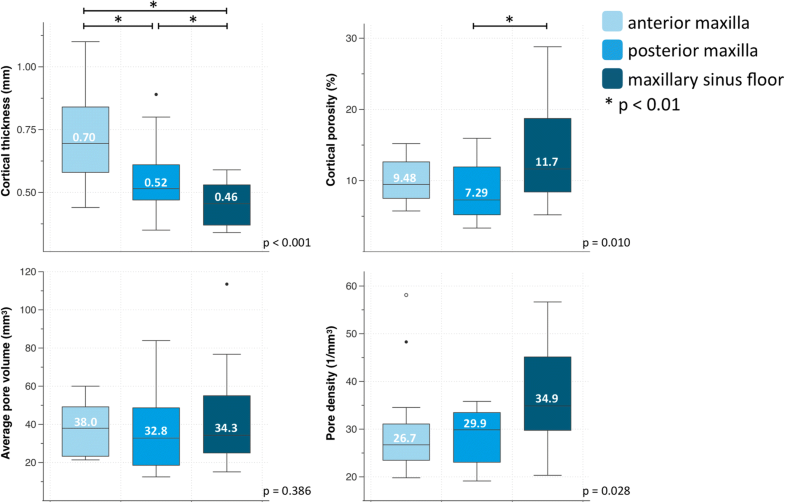 While AvgPo.V and Po.Dn did not present any significant within-subject inter-region differences (p = 0.386 and p = 0.028, respectively, with Po.Dn presenting no significant post hoc differences), Ct.Th and Ct.Po differed among the anterior and posterior maxilla and the MSF (p < 0.001 and p = 0.010, respectively). Specifically, the anterior and posterior maxilla presented a significantly increased Ct.Th compared to the MSF (p < 0.001 and p = 0.048, respectively), and the anterior maxilla demonstrated a higher Ct.Th than the posterior maxilla (p = 0.002). The Ct.Po of the MSF was slightly increased and presented the highest standard deviation of all three regions; a statistically significant difference was detected between the posterior maxilla and the MSF (p = 0.021), while none of the other pairwise comparisons reached statistical significance (p ≥ 0.216). Two representative examples are given in Fig. 3. The comparisons between specimens from male and female donors presented no statistically significant difference (p ≥ 0.051; data not shown). The analysis on the correlations among the investigated parameters is presented in Appendix 3. 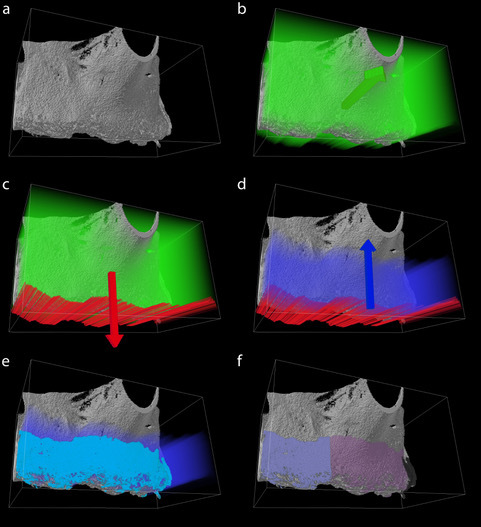 The results of the present morphological micro-CT study confirmed that the bone of the MSF is in general cortical, but it is slightly less thick and more porous compared to the buccal aspect of the anterior and posterior maxilla. Whether these slight structural differences between the MSF and the cortical bone of the neighboring alveolar ridge dictate a different approach during MSFA compared with lateral and vertical bone augmentation procedures is currently unknown. Specifically, during lateral and vertical bone augmentation procedures, multiple perforations are made in the cortical layer of the recipient site, before applying any augmentation material [6, 7, 8, 9], while this is currently not a standard procedure during MSFA. As mentioned earlier, perforating the recipient bed opens the bone marrow compartment and thus facilitates provision of angiogenic/osteogenic factors and cells in the augmentation space; this has been shown to enhance bone graft incorporation and/or promote bone formation [10, 11, 12, 13]. For example, accelerated angiogenesis and bone formation at early stages of healing were observed in titanium domes placed on perforated calvaria of rabbits compared with domes placed on pristine calvaria , while better graft incorporation and volume maintenance were observed when autogenous block-grafts were placed on perforated vs. non-perforated recipient bed at the lateral aspect of the maxilla of dogs [10, 13]. Similarly, in a recent histological evaluation of human bone-core biopsies from GBR sites augmented with deproteinized bovine bone, a larger number of vessels and amount of newly formed bone were observed in cases where the recipient cortical bed was perforated compared with those with a non-perforated bed . Although perforating the MSF during MSFA procedures appears thus reasonable like in the rest of bone regenerative procedures, and despite the fact that MSFA is one of the most frequent augmentation procedures in dentistry, this approach has been suggested only very recently . In this report, after preparation of the lateral window and elevation of the Schneiderian membrane, the MSF was perforated 8–10 times by means of either a piezoelectric device or a microsurgical hand-piece with diamond or round burs of about 1 mm in diameter. The authors reported no intra-surgical problems regarding the access through the lateral window with either the piezoelectric device or the microsurgical motor, and more importantly, no event of any conceivable postsurgical complications due to the modification of the surgical technique (e.g., excessive hematoma, hematosinus, wound dehiscences, postoperative sinusitis), in any of the 12 patients included in this case series; all patients showed normal healing and all implants, installed later, integrated normally. In this context, it has to be mentioned that the main osteogenic potential within an augmented sinus appears to derive primarily from the floor and the bony walls of the sinus, while the Schneiderian membrane contributes only minimal to the healing process [19, 20, 21, 22]. In this context, Ct.Th of the MSF presented the smallest standard deviation (about 50% smaller compared to the anterior and posterior maxilla), while the parameters describing cortical pore characteristics showed the highest standard deviation (up to 2.5 times higher compared to the anterior and posterior maxilla). Thus, the porosity of the cortical layer of the MSF might vary largely among patients, and it may be argued that intra-antral MSF perforations may not be necessary/beneficial for all patients, i.e., for those with a highly porous MSF. Nevertheless, as already mentioned, there is no information on the potential benefit of this approach or whether there are differences in the bone regeneration dynamics within the sinus, depending on the porosity of cortical bone of the MSF. One might argue that the success rate of implants in association with MSFA is already rather high [4, 23], and perforating the MSF may not add something significant in this context. There might be some specific clinical situations, however, where faster/improved healing may make sense. For example, it has been recently recognized that depending on the bucco-palatal width (SW) of the maxillary sinus, there are significant differences in terms of rate/amount of new bone formation after MSFA with a lateral window or transcrestal approach [24, 25], i.e., a wider sinus is associated with a reduced amount of new bone formation compared to a narrower sinus. Specifically, bone-core sinus biopsies from patients 6 months after MSFA with a lateral window approach demonstrated a significantly lower proportion of vital bone in wide sinuses (i.e., SW > 15 mm) than in narrow sinuses (i.e., SW < 10 mm) (13% vs. 31%, respectively)  and similar values have been reported after MSFA with a transcrestal approach . In perspective, it was shown in a recent study that at the height of 10 mm within the sinus, the vast majority of sinuses at molar regions are wide (i.e., 65 and 57% at M1 and M2, respectively, are > 15 mm) while the majority of premolar regions are narrow (i.e., 97 and 79% at PM1 and PM2, respectively, are < 10 mm) . It seems thus reasonable to suggest that perforations of the MSF would make sense mainly in the molar region, to accelerate healing and only in cases where there is a distinct MSF and some alveolar ridge height, i.e., there is no fusion of the MSF with the crestal bone of the alveolar ridge. A recent study, assessing regular CT scans of 100 patients , reported that fusion of the MSF with the crestal bone occurred in 20% of the cases. However, in the absence of any data from randomized controlled studies, obviously no strong assumptions can be made for the true benefits of this procedure; a randomized controlled clinical trial addressing this question is currently ongoing. In perspective, as limitations of the present study, lack of evaluation of bone mineral density, small sample size, and lack of information on dental and medical history could be mentioned. Nevertheless, a within-subject comparison was performed herein; it seems reasonable to expect that any possible influence on the various evaluated cortical bone parameters due to, for example, age or medical conditions, would be affected in a similar way and extent in the various aspects of the maxilla. Altogether, the present results showed that, compared to the cortical bone at the buccal aspect of the anterior and posterior maxilla, the cortical bone of the MSF is slightly less thick and more porous; however, high inter-individual variability, especially regarding cortical porosity, was observed. Whether the slight structural differences between the MSF and the cortical bone of the neighboring alveolar ridge observed herein alleviate the theoretical benefit of multiple perforations in the MSF during MSFA, similarly to the standard approach during lateral and vertical bone augmentation procedures, has to be assessed in future clinical trials. The authors thank Mag. Dockner for his support during micro-CT scanning. The work was supported solely by the institutions of the authors. The study protocol was approved by the ethics committee of the Medical University of Vienna (EK-Nr. 1557/2016).